Imec introduces a cognitive baseband radio (COBRA) architecture targeting 4G requirements at up to 1Gbit/s throughput and multiple asynchronous concurrent streams (for instance simultaneous digital broadcasting reception and high-speed internet access). The low-cost, flexible architecture answers a new trend in wireless communication where terminals give their users ubiquitous broadband access to a multitude of services. 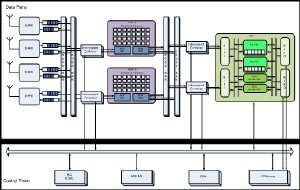 COBRA - imec’s reconfigurable baseband platform architecture. COBRA is an interesting architecture for future mobile handsets and all kinds of battery-powered wireless connectivity devices, as well as for base-stations for small cells. The COBRA architecture can be customized to meet the requirements for many standards (WLAN (IEEE802.11n to .11ac), cellular (LTE to LTE-advanced), and broadcasting (DVB-T/H to DVB-T2)) and dedicated needs. COBRA contains imec’s energy-efficient high-performance ADRES reconfigurable baseband processor featuring multi-threading and wide SIMD (single instruction, multiple data) capabilities. The associated tools enable C-based compilation, as well as assisted parallelization over multiple cores and/or threads. This speeds up the design leading to shorter time-to-market and more energy-efficient radios. Imec’s low-power flexible forward-error correction (FlexFEC) processor template achieving high-speed turbo & LDPC is also included. An LDPC-specific instance for multi-standard broadcasting has also been derived to further optimize power and area. Moreover, COBRA features a novel ASIP (application-specific integrated processor)-based digital front-end enabling flexible filtering synchronization and spectrum sensing. This component also enables hierarchical platform activation, resulting in idle power in the range of 2mW in 65 low-power CMOS technology for the baseband platform. In its green radio program, imec partners up with industrial players to design the next generation cognitive radios, targeting increased integration and improved power efficiency radios. The COBRA platform, which is being designed together with the industrial partners of imec’s green radio program, is now available for licensing. The reconfigurable radio architecture and related cores can be evaluated and tested at imec.